My name is Jennifer DiBrienza. I taught elementary school in New York City public schools for 9 years and began using number strings then. When I moved to California, I completed my PhD in elementary mathematics education and now I teach at Stanford University and consult with school districts and education companies. Last week I worked in a 2nd/3rd grade classroom. The students had started the school year with data collection, graphing and sorting, so they had done very little computation at about 5 weeks into the school year. The classroom teacher and I decided we’d build a subtraction number string to introduce the second graders to strings and to revisit them with the third graders. We started with one we thought almost everyone would have an accurate solution for and it would give us a chance to illustrate subtraction as difference on an open number line. Then we planned to take baby steps from there. Most students agreed that the solution to the first problem was 2, and most of them thought of it as “difference” and I was able to show it on a number line with two jumps of 1 from 19 to 20 then 21. One student removed 19 from 21 by first removing 10 (landing at 11), then removing 1 (landing at 10), then removing 8, landing at 2. As we went through each of the problems, most students thought of them as “difference” problems, although there was usually someone who took away one number from the other. It provided the perfect opportunity to look at each of the solutions and question what each part represented. Here are the two number lines we had for 35-19. For the first one, the student started at 35, removed 19, and landed on 16. His answer was on the line (it is where he landed). 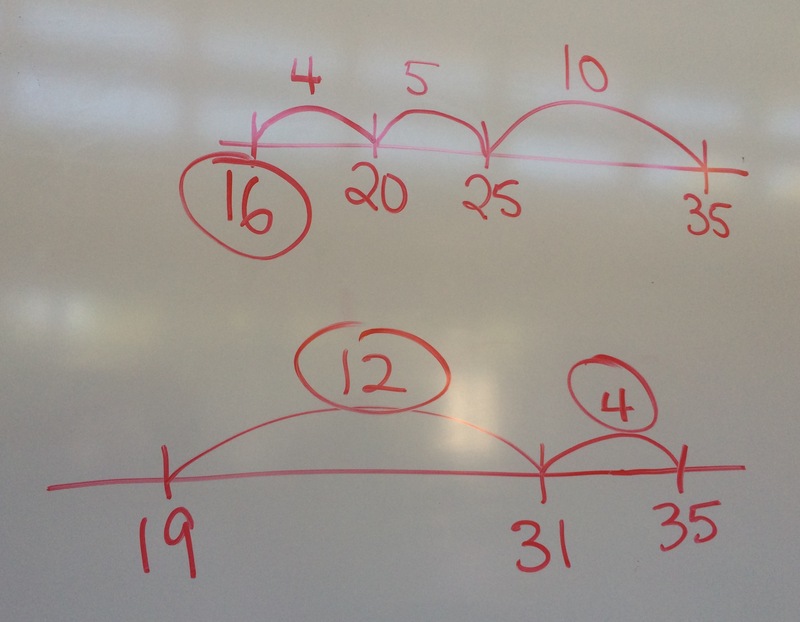 For the second number line the student found the difference between 19 and 35. She took what she knew from the previous problem (that the difference between 19 and 31 was 12) and added 4 more on to the 31 to get to 35. On this number line, the answer is found by adding up the jumps that are taken (the difference between the two numbers). When we took a few minutes and compared these two solutions directly, asking where each part of the problem was and what they each represented, the students were able to explain where the 16 was and why the two illustrations looked different. It was a challenge for them! But thinking about this complicated idea gave them a deeper understanding of the operation and its properties and left them feeling more confident about how they might approach these problems going forward.